LOVE LOVES TO LOVE & THE REWARD OF LOVE IS LOVE…Misty Edwards. When God narrated His story to Moses of how human beings first came into existence on this planet; He didn’t explicitly give a reason why He did it and Moses didn’t ask. In fact, after God had made everything on this planet, then he said…. At first glance to me it seems like God made mankind for them take care of His perfect creation; like gardeners taking care of their master’s garden. But the key word in Gen 1:26 is RULE and throughout the generations God’s hidden intentions for putting us here on this planet were revealed little by little until it reached it pinnacle when God himself became a man to show us why? 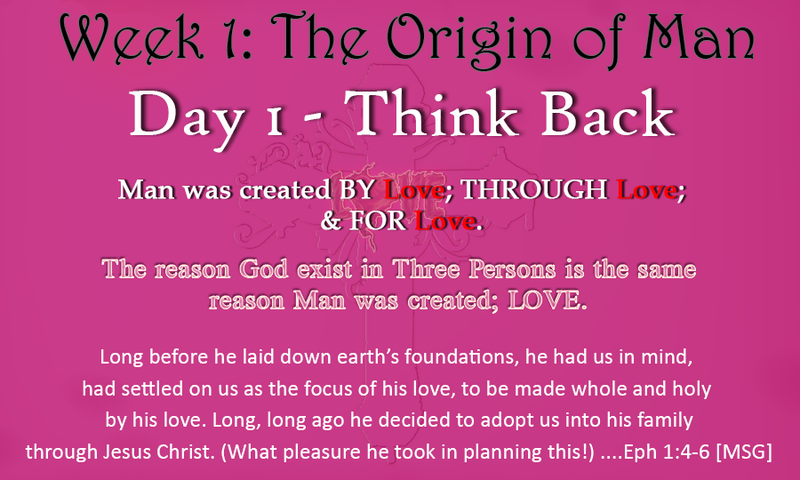 Today, I want us to think back to what our pastors, teachers, disciplers, parents, or what we discovered ourselves (in the bible) about Why God created us (man)? We will unfold this quote throughout this week. Ephesians 1:4-6 – For he (God) chose us in him BEFORE the creation of the world to be HOLY and blameless in his sight. In LOVE he PREDESTINED us for ADOPTION to SONSHIP through Jesus Christ, in accordance with his PLEASURE and WILL, to the praise of his glorious grace, which he has freely given us in the One he loves. God open the eyes of my heart to see into your heart and your thoughts and intentions towards me. To know this is to know you and to know you is to know who I really am. For I know my life is hidden in you and it’s your good pleasure to make it known to me if I seek you. Amen.